I'm almost done with three more of the Arcade Marquee lightboxes I've been creating. The painting is done, now I need to pick up three lights. Nickus has started up a new campaign using Wizards of the Coasts' d20 Modern system. It looks like the game is going to delve into a mixture of magic and super science in the contemporary world. Last night we completed character generation and began the first adventure. I put together a pattern and design for this new costume sword prop. I decided to cut enough pieces to assemble two swords, I'm curious if it'll be faster to make two in parallel than one after another. I'm doing everything on the scrollsaw for this project. I'll post the cut pattern I designed once I'm sure the design will work. I'm not quite sure how well it will look until I get it assembled. I'm hoping to do a scabbard as well, that will be new. I'll have more pictures posted at Flickr. Hopefully I'll shoot the next Hyperion video on the 28th of February. 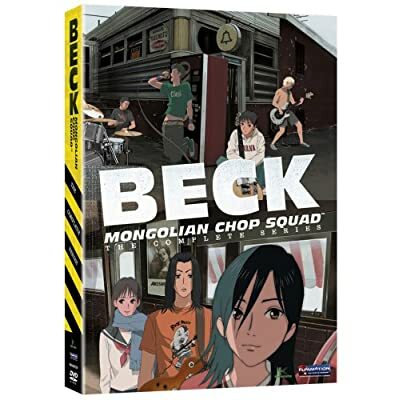 On Dan's recomendation, I started watching the Beck anime series. His recommendation was right on, I'm really enjoying this series. Its not an action packed anime, just a very well told story with good characterization and none of the drek that often turns me off from some series. Netflix just sent the third DVD, I'm thinking I might purchase the whole thing later. OrcCon 2009 was a lot of fun, they had 3 tracks for Roleplaying Games, each game set to run 4 hours. We got down there early enough to sign up for a Call of Cthulu game set in 1100's Japan, a d20 Conan game and as well as Houses of the Blooded. Houses of the Blooded is John Wick's (L5R, 7 Seas) new game. It takes an interesting approach to RPing courtly intrigue. It was a great convention game, I'm curious how well it would do as a long term campaign game though. Thanks to OrcCon, I've got an idea for a sword prop I'm going to start working on in parallel with the Hyperion Gunblade video series. I can't work on the Gunblade without having a camera going, but I can work on this prop. I'll post updates here as it progresses. Going to a local gaming convention called OrcCon tomorrow. Gaming Conventions use to be a much bigger deal when I first got into gaming. I think they peaked around the time of the collectible card game craze and declined after that. Last year I went down there and played in a couple of games, had a pretty good time. Step Two continues pre-processing the source footage by deinterlacing it. I find the interlaced tearing artifacts very distracting and I've been a lot happier with the footage I use after its been processed. I use Avidemux2 on the Mac to deinterlace the VOB files previously ripped using MacTheRipper. The process converts the file from a mpeg2 VOB file to a MJPEG AVI file. After launching Avidemux2, click Open and select the VOB file to be deinterlaced. Click Yes to Index the MPEG file, I don't append all the mpeg files together. Skip the notification about multiple audio tracks. On the left hand side, under Video, select MJPEG (lavc) from the pull down. Click on Configure and change the setting from 90 to 100. Click on Filters and then select Interlacing on the left hand side and TDeint from the list. Click the + sign to add the filter, opening the TDeint window. The selections for Field Order and Interpolate depend upon the individual DVD. If one set of choices looks bad, return to this window and try different ones. For Type, select Modified ELA-2. Click the Okay button, then Click the Close button. At the top, to the right of the Calculator button is a pull down menu, select Side to display a side by side comparison of the before and after results. Here is where you can judge if the Field Order and interpolate settings for TDeint are correct. If the results look deinterlaced, click on the SAVE button at the top to deinterlace the footage. I uploaded a higher quality version of my old Bride of Berserk AMV to Youtube. If you haven't watched it yet, here is a perfect opportunity to do so now.